A very powerful way to put together a funnel really quick. The only thing that you're going to have left to do if you go into the funnel marketplace and put together your own funnel is creating your own videos. If there's video templates that you need to use embed codes in and things like that, you're going to have to create those videos yourself or have somebody else do them. That's the only downside, but videos are really powerful. They help sell your product or service really quick, so I highly recommend you figure out a way to do that. Or you can cut your own if you don't have one. Because it will definitely move the needle for you. There are two primary ways to use this platform to create MLM sales funnels and either generate leads or sell your own products, or things like that. The first way is to use it in a manner that attracts business opportunity seekers to look at your network marketing business. The second is to create sales funnels in your network marketing business that attract customers to your network marketing business. Now if you are in the United States, the FTC (Federal Trade Commission) is looking really hard at companies nowadays; especially companies that are internal consumption machines. If you are going strictly the business builder route, you are leaving yourself a little bit susceptible to the criticism of the FTC. I can tell you personally that I have over a hundred customers in a previous business that still buy on a monthly basis. They continue to buy, month in and month out. In many cases business builders are flaky when it comes to longevity. They'll come in and some will stay and run the distance, but many will come in and go after six months when they just don't have the fortitude to stick it out and make it work. Whereas a customer gets on the product and loves it and stays on it. There's a huge difference between someone who just joins a network marketing company because they're looking at the opportunity and they're thinking, “Man, I can get away from my stinking job or whatever it might be,” and somebody that comes in and says, “I want to try this product,” and they fall in love with it. Those people stick around forever. It's a very, very powerful thing to do. Let's get into this. Let's build a quick funnel inside Click Funnels for your network marketing business and show you how Click Funnels can be used in your MLM. Here in funnels we're going to click build a funnel in the drop down menu. Once we select that, we will get a list of funnel types. We're going to go with a customer funnel this time. Let's do a standard video sales letter funnel to sell your network marketing product. This is a great funnel type, actually. Let's go ahead and click get funnel. Keep in mind, if you don't download the funnel you can actually build your own. Very simple thing to do. But these are great ways to start. What you start with here is an order page. Typically you can start with what's called a lead magnet or a sales page, but in this funnel it starts with straight up an order page. It's going to be a video once it shows you the picture, followed by a series of copywriting messages, and then ultimately an order form at the bottom that you scroll to to fill out and buy. It's a straight up video sales letter page. Now if you wanted to get them on an email list first, you could totally do that. You could add a new step. You could add what's called a lead magnet up here at the top and offer them something, what's called an ethical bribe. For example, an e-book or a video series. Then collect their email address so you can remarket to them. In this remarketing you would send them to the URL that this video sales letter page is on, which is right up here at the top right. This URL can be customized as well under settings. You just have to set up an account with SendGrid and tell Click Funnels which URL you want to use for this funnel. Then you can totally customize this if you want. Not necessary, but again, at the end of the day you want to test. Split testing will tell you whether changing the URL is going to have any impact, so make sure you do that. Easy way to split test here, create a variation and they'll show you which one's performing better as you drive more traffic to them. What I like to do is just highlight, hit enter on the URL, and typically it will show up. If it doesn't, go ahead and click edit page. It will usually take you right to it. Notice that we have “Attention, for those who are serious about developing your online business to the next level.” Then you got a big headline here, which is typically curiosity-driven. What's in it for me is a great way to look at headlines, and then a video, which is really going to be the meat and potatoes of delivering the message. Keep in mind this is just a template. You can do whatever you want with this. What I recommend you use is a platform called Advanced Marketing Institute. If you're not a copywriter, you can use this. It's a great tool to start with if you don't understand what words are power words that influence decision-making online. They have what's called a headline analyzer. You click that and it will give you a field here. You can test copywriting in here, see if your headline's going to perform. For example, if I copy all this right here and then I paste it in here, let's see how good their headline is. We'll select business and professional services. In most cases that's going to be the one. If you're running a supplement offer then you're going to do that instead, which would be like food and dining. If you're a business, let's check out this headline and see how it does. It did okay. Not the best, but it did alright. If we were to alter this headline … and this is the easiest thing to do. You pick a preexisting template and then you alter it to fit your need. Everybody wants to know how to get a beach body, “without crash dieting or exercising,” provided that your product can deliver on that statement. Then you insert your own pictures. Then you add your own little text down here. That basically is follow-on text to this. “What you will learn from this presentation,” if it's a webinar, but otherwise “What you will learn from this process,” or from this system, or whatever you're going to put there. If you're going to sell them something, the video needs to do most of the selling for you. If you don't like the background, you can always change the background. You just would click the little setting button on the green bar there, and then you would add a background image. There's a number of background images you can pick from. You would have to upload your own, though, and then insert that. Make sure the image that you're going to upload is congruent with the message you're delivering. It needs to be big enough that it makes sense and that it's congruent. You can create whatever you want in very short order, make any kind of tweaks you want in very short order. Don't forget to save things before you exit out. That's how you use Click Funnels for MLM to generate customers and/or generate leads. Don't forget under settings to integrate your auto-responder and to follow-up with them via email, because you want to collect them on a list. When you are driving traffic, if you use paid advertising like Facebook Ads or Google or Bing Ads, which we can do for you if that's something you don't know how to do. Just reach out to me. Set up an appointment on my calendar. There's a contact tab somewhere here on this page. We can chat. My guys over at Social Web Net, we can always do that sort of thing for you if that's something you're interested in. Once you have a good sales funnel set up you can drive traffic right to this link and you can start generating sales and leads right away. It's a very powerful process. This platform is extremely powerful and it's going to be very helpful in you either acquiring customers and/or acquiring business builders as leads. When you go the route of acquiring business builders as leads, I always go the Tripwire route usually, which allows you to offer a free lead magnet and then get them on a list. Because once you get them on a list, you communicate with them and build trust. Something like a lead magnet funnel would have worked really well here for this. Then you just pick a template once again and you run with that. Whatever you want to do, you can always customize if you pick a template you don't like, and then you continue to gear that towards your network marketing offer. 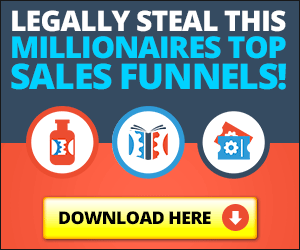 That's how you use Click Funnels in your network marketing business to generate leads and customers. If you did, share it on social media.